Imagine the nails on the chalkboard version of slurping. It dives deep past your ears, piercing into your brain. By reflex, I squeeze my eyes shut and grimace. “Good heavens.” I expressed loudly. “Yea…sorry.” *TSSSSFFFFTTTSSSSSFFFFF* “I’m even keeping it quiet.” Andrew responded, with a smirk. I was cupping coffee, and getting a headache at the same time. I stood there slurping my coffee like a normal chump, trying my darndest to make obnoxiously loud noises. I did discover, after choking on a sip, that you shouldn’t breathe the coffee. I recall my early experiences, taking steps into the world of coffee. At the time, I wasn’t dipping toes in so much as just wading into the running river. But even then, this was different. When you are in a room cupping coffee – it all feels different. It’s fancier, it’s structured, it’s purposeful – there are rules, so there must be expectations. There are people standing around waiting looking like they know exactly what's going on. There are people measuring and grinding coffee precisely. Everyone else MUST know more than me. It just seems that in this environment, there is a wrong answer and a right one. That the answer requires some level of experience and knowledge which you haven’t attained. That is a question which will freeze even me from time to time. When you are new, it’s like someone asking you to do arithmetic in a language you don’t speak. This becomes all the more daunting cupping coffee – when you start hearing other people in the room describing tastes you just don't see yourself. All the more so, if they describe a taste that you don’t see even after they say it’s there. If the above makes no sense to you in the context of the coffee you are tasting (or about to be tasting), how could you NOT be intimidated? I’ve taken people through coffee cupping the first time, and also watched new adventurous folk go on their own. 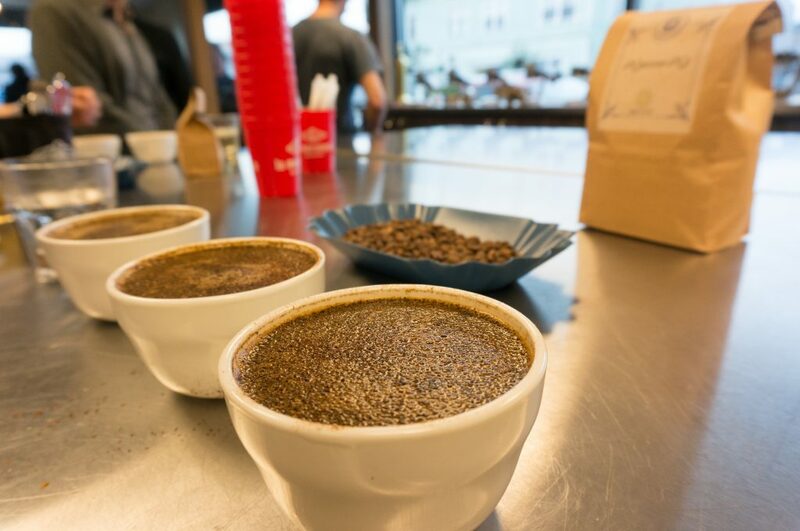 Let’s demystify the process, so that you don’t have to walk into a cupping room and feel lost, or like everyone else knows more than you (we really don’t). It’s important to know that this process is designed to give the clearest picture of what a particular coffee is capable of showing. The coffee cupping process can seem strange the first time, but every oddity is there for a good reason. We just want to smell, taste, and experience the coffee as best as we can. In many respects, there’s no purer way to experience ‘the coffee’ in and of itself. Just brewing the coffee and drinking as you normally would is about more than just the drink. 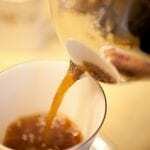 It is the full sensorial and ritual experience of enjoying a cup, whether alone or with others. Though cupping coffee does have ritual as well, it is about discovering the aroma and tastes of coffee itself. The goal of this practice can vary depending on your intent. 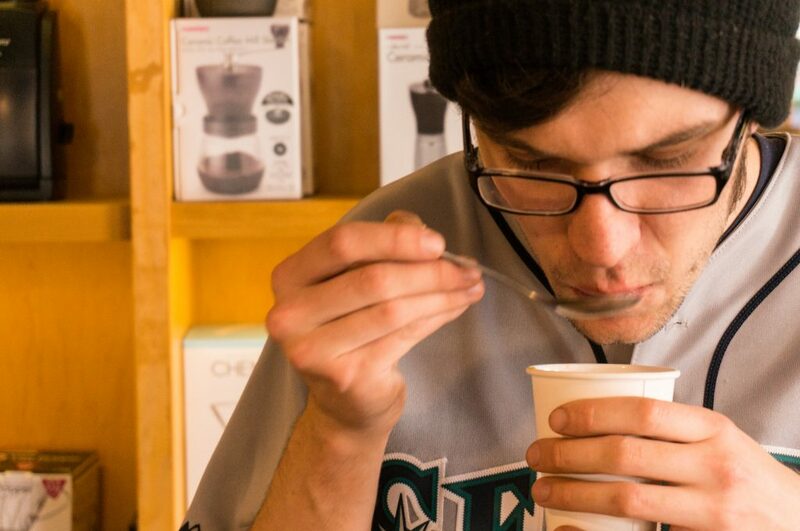 On a professional level, individuals cupping coffee are attempting to assess the specific coffees in terms of 5 elements: body (how it feels in the mouth), sweetness, acidity (think like citrus acidity, which is common in coffee), flavor, and aftertaste. However, you are certainly not bound to this particular level of strict interpretation. 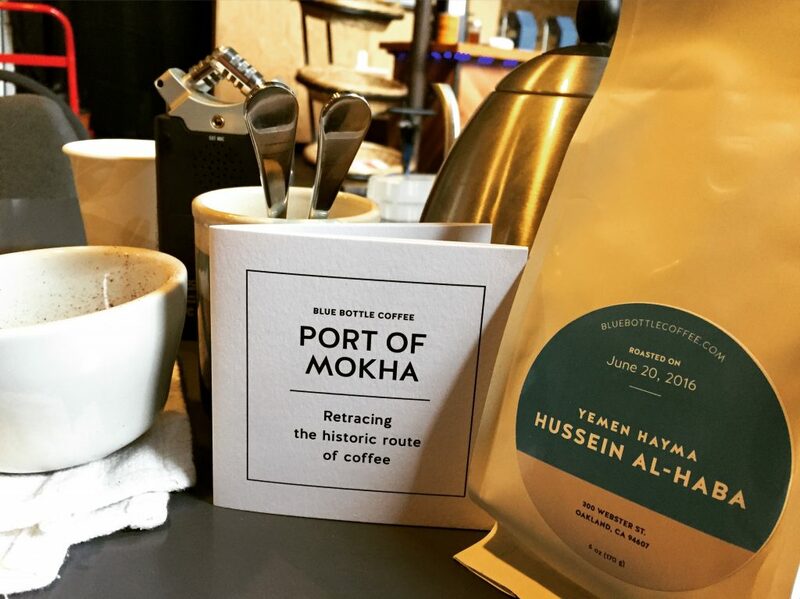 I personally often will enjoy the process as the process itself – an exploration of coffee. It’s a different way to enjoy coffee, and one which encourages me to think about it (though I can find enjoyment in cupping without thinking at all). We begin by measuring out specific amounts of coffee into sets of 1-5 cups for each coffee. A ‘technically correct’ cupping – one which follows the professional standards and guidelines [as outlined by the Speciality Coffee Association] – will use 5 cups for each coffee. The purpose of this is to detect particular defects which can be elusive. An example of this is The Potato Defect – a problem with coffee beans that can only be detected by taste. I’ve been able to run into this once now, on a table where we had 3 cups for each coffee. One coffee had the potato defect, but you could only tell in one of the three bowls (because one of the beans in that bowl had the defect). That particular bowl reminded me of old microwaved french fries, while the other two were the coffee’s normal nutty and cocoa-like flavors. A more casual event of cupping coffee – one in which the goal is experiencing the coffee for explorations sake, and not utilizing the professional guidelines – can just use 1-3 cups per coffee, depending on the experience that the facilitator wishes to create. I prefer three, just because you can sometimes find oddities, and it reinforces a certain pattern of thinking. You can also do some fun alternative cupping exercises with three. An example is a triangulation, in which each set of 3 has 1 cup that is different from the other two and you try to determine which that is (this can be VERY challenging). You can do this with as many coffees as you like – sometimes I’ll even do this myself at home, with a single cup, when exploring a new and particularly interesting coffee. Once the coffees are weighed out in their respective cups, the coffee is then all ground to a uniform size. 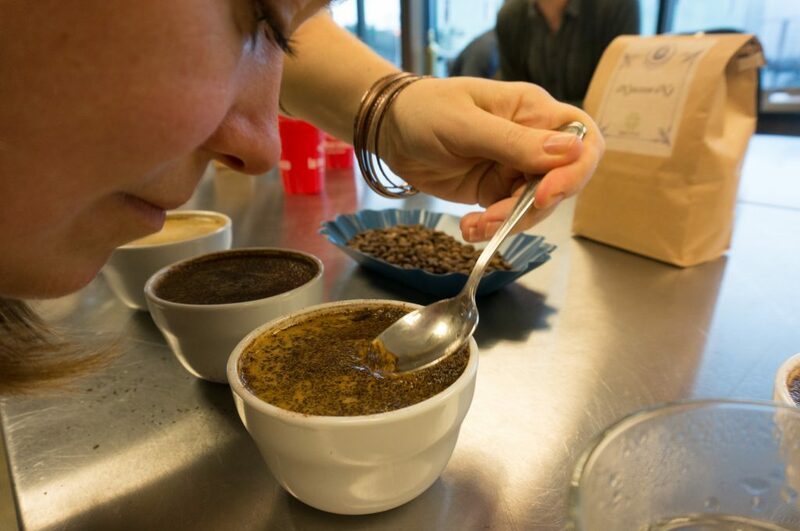 With the coffee ground and set out in cups, we begin our first sensory experience of cupping – the dry aroma. We go around and smell the freshly ground coffee before adding water, so that we can take note of the coffee’s unique aromas before brewing. This isn't just to enjoy them for the sake of it being a part of the coffee experience, but also such that we can compare with the aromas and tastes of the coffee after it’s brewed. Once everyone has had a chance to observe the dry aroma, water is added and the brewing process begins. Take note: this is happening in the cup. There is no filtering or transition to another cup. We simply want to understand how this coffee behaves when it is brewed. There is a second round of smelling after the water has been added, in which we take in the fragrance. There is a difference in these two steps – though I often skip the second when I’m not being especially studious. 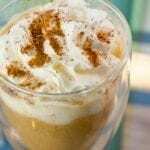 But you can take note of how the smell of the coffee changes with each step and see if that informs your interpretation of the flavor at the end. When water is added to the coffee grounds in the cup, it forms a ‘crust’ at the top. This ‘crust’ of grounds and oils seals in the cup a lot of distinct aromas. After the brewing time of 4 minutes is complete, we use our cupping spoon to gently break open that crust, simultaneously smelling all the amazing aromas that are released when that happens. 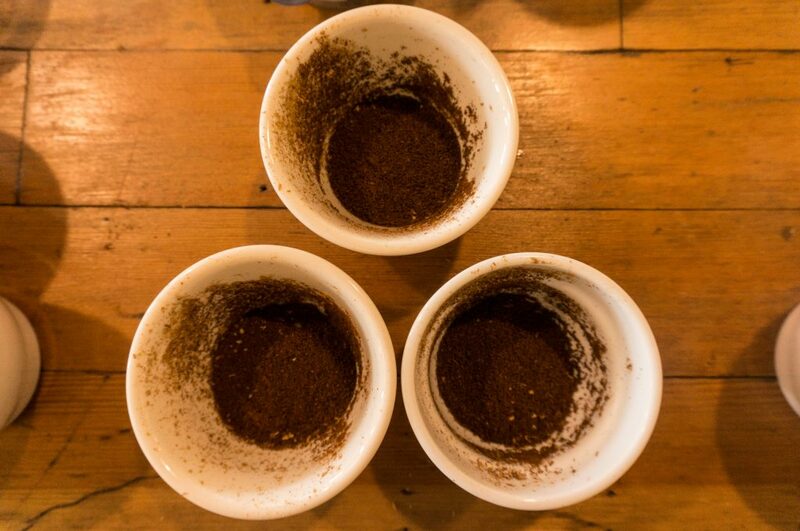 Note: you will notice that the cupping process has FAR more steps dedicated to the smell of coffee than the taste. That is because our sense of taste is high dependent upon our sense of smell. Understanding the different components of smell you can get from the coffee will contribute to informing your taste. (As a very loose tangent, this is also why most travel mugs are terrible for drinking coffee because they keep you from smelling it). The crust breaking process causes most of the grounds to sink to the bottom of the cup. There’s typically a film of some grounds and oils left on top, and those are scooped out, so as not to interfere with the flavor. Then we wait for the coffee to cool. The tasting process is pretty odd and unique. We use deep spoons (basically tiny bowls if you want to be cute about it), to scoop out some of the coffee, and then we slurp that coffee (often loudly). The purpose of this slurping is to essentially spray the coffee across our entire palate. Advanced: You want to coat as much of your tongue and mouth with the coffee so that you have every chance to taste each possible element – to understand the full capability. Just think about how you taste different things on different parts of your tongue. Coffee can represent a huge range of flavor possibilities, so if you don’t give yourself a chance to taste all of it, you can miss something interesting. 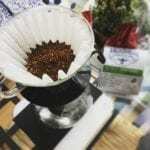 If you are just starting out cupping coffee, don’t worry about the intricate details above. Coffee is so ridiculously complex, and when you are beginning, your senses will be overwhelmed. That’s ok. Just slurp the coffee like you might a hot soup – if you feel adventurous, give it a more aggressive try (but don’t choke on it like I did). It’s interesting to me how the process of cupping has informed my own home brewing process. Every time I brew coffee at home – usually on a Chemex these days – I’ll go through a bit of a mini cupping process. I’ll look at the coffee beans that I’m about to grind (sometimes actually checking for the odd bean to remove, but I usually am not that studious). I’ll take a few moments before starting the brew to enjoy deeply the aromas of the ground coffee. As the coffee brews, I’ll observe the aroma of the wet grounds in the filter. 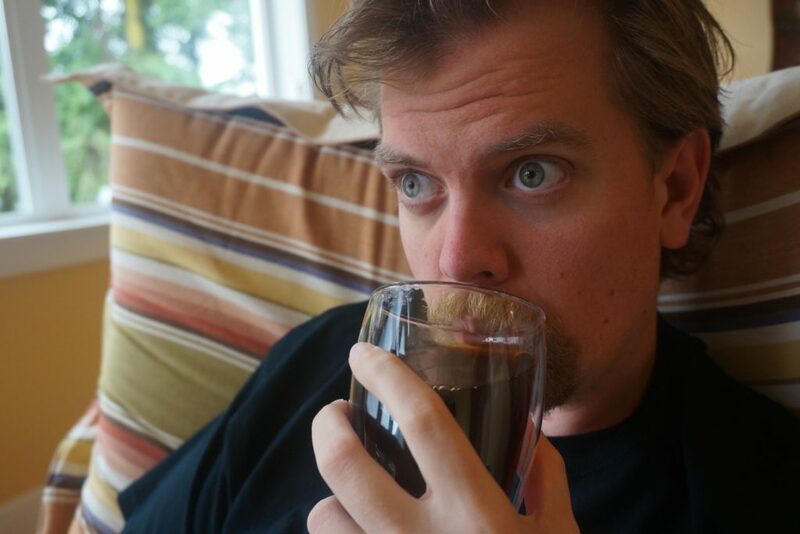 Then lastly before enjoying the cup, I’ll take a moment to enjoy the aroma of the brew in the vessel. All of these other experiences are part of the coffee to me, and well worth the (for some) longer preparation time. I’ve witnessed this so many times – new people coming into the cupping atmosphere. They start off with a curiosity and interest, but they either get overwhelmed or feel pushed out (and I’m not ashamed to say I’ve experienced this myself). They don’t know what to say. Maybe they are afraid of being wrong, or saying something offensive, or being pushed out of the group because “they don’t get it” – all of these are very legitimate and natural feelings. How do you overcome what is seemingly inevitable? Practice these three wonderful words. So often that’s my approach. I do this for the enjoyment. If I am struck by a particular taste, aroma, or experience – if I suddenly remember a treat I had, then that’s all the better. But I don’t usually go into cupping coffee trying to find an answer. So regardless of what you think or feel about cupping, just do it anyways. Ignore what everyone else says. You can even make a game of coming up with the most outrageous taste descriptions if you want to break out of normality a bit. My favorite thus far has been ‘canned chili’ (there was a meatiness and strong pepper to it…weird I know). Say the first thing that comes to your mind, and don’t worry about whether it’s right or wrong – because in this land of personal interpretation and experience, there is no such thing. Find a group of good people and just dive in – forget about that of which you are unsure. Forget about what other people know. Dive in, ignore everything else, and just listen to yourself react to the experiences. What is your memory telling you? 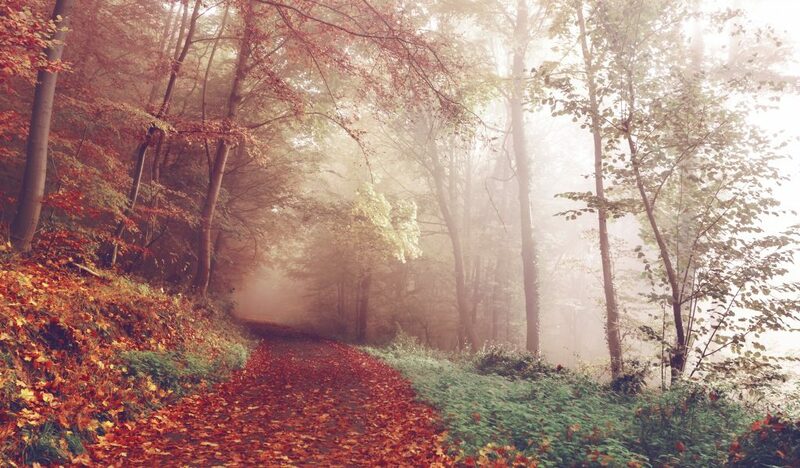 Does that aroma remind you of a time and a place? Share that. Does that taste remind you of an adventure you took long ago? Share that. Aromas and smells of coffee don’t have to align with food either – you can say “this reminds me of a makeshift tree swing in the middle of summer,” and yea I know that sounds absurd but who f*cking cares? If that’s the experience that pops in your mind, that is awesome. 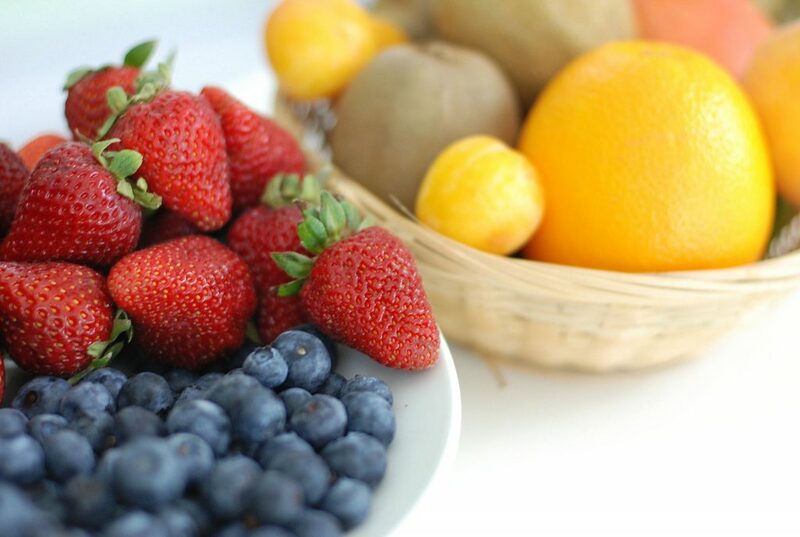 Allow your senses to paint a vivid experience from memory. There is no wrong. There is no right. There’s just what you experience for yourself. You don’t need to justify anything that you think or feel or taste when it comes to cupping coffee. What you experience is 100% legitimate and real, regardless of whether anyone else agrees with you. Even, and especially, if you just don't know what you are experiencing, or you can't explain it. I like hearing every person’s reaction because there’s almost always something to learn that is awesome. What has your experience with coffee been like? Comment below and let me know! What a great article. Thanks for taking the time to do this. It does make cupping a little less intimidating.